This Makita 10 in. Table Saw is versatile with a powerful 15 Amp motor for use in the shop or on the job site. It combines convenience and ease-of-use features with large cutting capacity to handle a range of professional applications. This saw can rip 4 x material in one pass and takes up to a 6 in. x 13/16 in. dado blade. It includes an electric brake, large on/off switch and easy-to-read scale for faster adjustments. 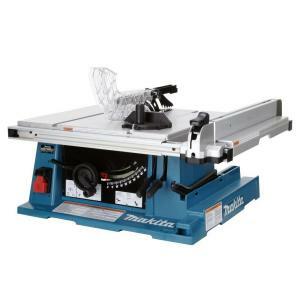 Tbook.com crawls the web to find the best prices and availability on Table Saws and related Tools and Hardware products like Makita 15 Amp 10 inch Corded Contractor Table Saw with 25 inch Rip Capacity and 32T carbide blade. For this page, related items include products we find that match the following keywords: "Table Saw" at our vendor partner Home Depot. Makita 15 Amp 10 inch Corded Contractor Table Saw with 25 inch Rip Capacity and 32T carbide blade is one of 60 Table Saws and related products listed in the Tools and Hardware section of Tbook.com If you have any questions on this product, please give us a call at 734-971-1210 during the hours of 9am - 5pm EST for assistance. Thank you for shopping at Tbook.com, the Internet Department Store!